Today ibomhacktivist tweet "MasterCard.com DOWN!! 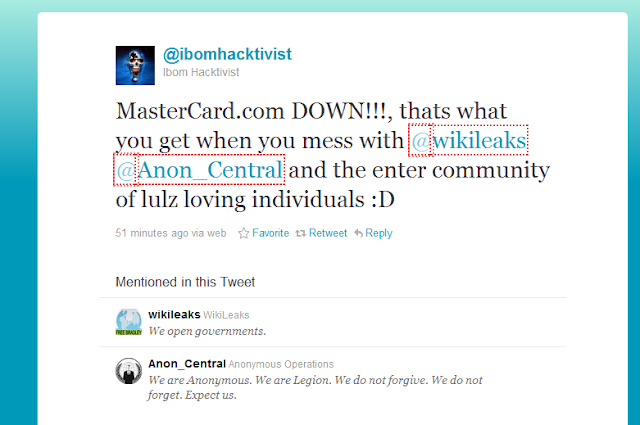 !, thats what you get when you mess with @wikileaks @Anon_Central and the enter community of lulz loving individuals :D"
We have check that is MasterCard.com is really down & YEAH , Its down ( Via ). The Ddos Attack is in support of Wikileaks & Anonymous by Hackers. This can be the part of Operation Antisec started by Lulzsec and Anonymous Together. It’s irrelevant if the ip's are traceable or not. It will not be possible for any police or court differentiate between the users who voluntered to the task and the ones who had their computer hijacked (with a virus). This is 2nd time MasterCard becomes the target of Anonymous.